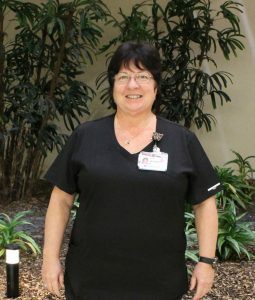 This week we’re getting to know a little more about Jackie Dimmer, RN, a nurse in our Float Pool. How long have you worked at Parkwest? It will be 10 years in January. Why do you love your job? It is very gratifying to be able to take care of our patients and their families. I also love working with the exceptional people all over the hospital. What are you thankful for? My family, job, great co-workers and good health. I am blessed to have my son, daughter-in-law and youngest 2 grandchildren live with us. What is your favorite Thanksgiving tradition? Spending time with my family. Where would we find you the day after Thanksgiving – Black Friday shopping or watching football? Black Friday shopping 1-2 hours, and then family time. What is your favorite Thanksgiving dish? My daughter-in-law’s mashed potatoes. She puts Velveeta Cheese and cream cheese in them. What do you like to do when you’re not working? Spend time with my husband and family. My son, daughter-in-law and youngest grandchildren live with us and we work together on projects and just have fun. I also love to travel! I go to Texas and Florida to see my daughters and grandchildren.